Stand with feet about shoulder width apart and dumbbells in hand. Bend at the waist (without rounding the back) allowing arms to hang. Keeping a slight bend in the elbows, raise the arms to horizontal, and exhale throughout the movement. To put additional focus on the lower and middle trapezius and outer back, briefly squeeze the shoulder blades together at the end of the movement. Lower the weights to the starting position, inhaling throughout the movement. 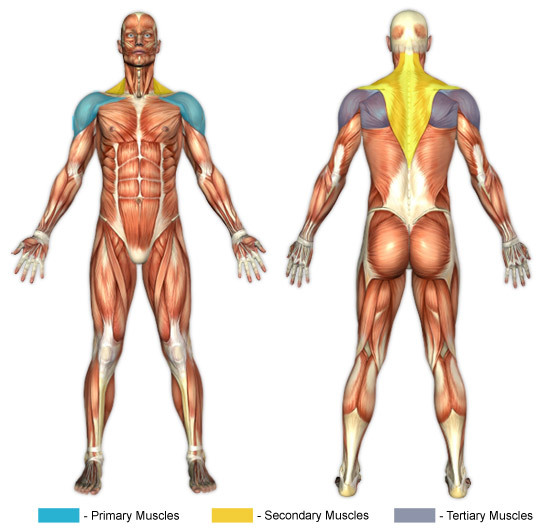 In addition to working the rear deltoids (shoulders), squeezing the shoulder blades together at the end of the lift uniquely targets the lower and middle trapezius, as well as the rhomboids and teres minor of the outer back. A variation of this exercise can be performed by positioning the body face-down on an incline bench. To prevent lower lumbar injuries, don't round the back when bending at the waist.